Interactiction with the islands and dry air injection has put a temporary weaking in Frances. I think this is temporary, but it should hold high cat 3 or 4 status for a while. Winds are now down to 125MPH -- a category 3... still a very powerful hurricane. The track, however, still remains similar to the previous one. Local county by county information will no longer be updated unles there is breaking news here -- it's just impossible to keep up because of the size of the area under Hurricane Watch. Use the links in the last article to view county emergency management webpages. Florida Disaster.org is the state em page, with links to locals as well. ** SITE NOTE ** This website is receiving way beyond record traffic today, it will be slow, it will go down ocasionally, but should be back up shortly when that happens. We've done everything we can to help this along short of dumping zillions into bandwidth and hardware to keep it going. Apologies in advance. She appears to be getting back together as we speak. Could easily regain a little strength. I'm still thinking cat 4. I'm going with cat 3 first landfall and cat 2 second Panhandle landfall . Sorry folks, wundergrounds 11pm map was in error, they have winds at 135 for 11pm. They are actually 125 mph, per NHC advisory. Jason K Where are you. We need some of your expert opinion. He's probably on the air...maybe Clark will come back (hopefully) soon. If there is a second landfall in panhandle then it will be Cat 3. The gulf is very warm. NHC first put out a set of advisories at 115kt, then quickly put out a new, corrected set at 110kt. The rounding in the calculations means one is listed as 135mph and the other as 125mph. In any case, it's still a beast to be dealt with. Latest recon did not report an eye with the storm and a 950mb minimum pressure. Max flight level winds in the NE quadrant are just 105kt. We'll see how long it takes to get it's act together. Another excellent 11pm discussion by Stacy Stewart -- he's developing quite the (favorable) reputation amongst the meteorological community here at FSU, that's for sure. In any case, this is going to be a long night...so I'm headed out. Take care everyone...stay safe. If she holds together. Ft Pierce/ Cocoa Beach for 1st landfall and St Marks/ Appalachicola for second landfall. SYNOPTIC SURVEILLANCE DROPSONDE DATA INDICATE A STRONGER 700-400 RIDGE BY ABOUT 20 METERS. Isn't this the same 20 meters from the sondes we had a problem with yesterday? 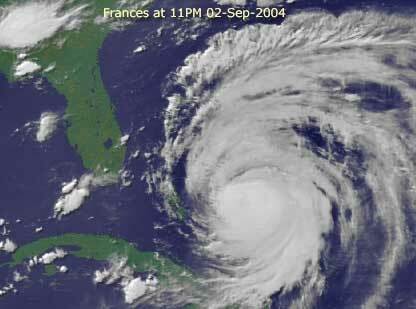 Does anyone have any predictions about when Frances passes over the gulfstream late tommorrow? Will that give it an unfortunate kick before landfall? Even though I'm a newbie on this newly found board, sorry...but I strongly disagree. I think when this puppy hits the Gulf Stream, watch out. I see alot of Andrew in Frances. jaybythebay, the storm is not forecast to remain over the Gulf but for about 12-16 hours. After moving over land, it often takes some time for the storm to reorganize itself. It is highly improbably that Frances becomes a category three in the Gulf unless it remains there for 2+ days, which in itself is highly unlikely. Warm waters are but one factor; you cannot simply just put a storm there and expect it to rapidly intensify like that. The *only* model which is calling for that is the UKMET, which has had a nearly 35mph intensity error at 3+ days...and also does not weaken the storm as it crosses over Florida at all. Suffice to say, you can discount that one. No real change in my previous thinking, which is scattered about the last thread. Might trend a tad further north on landfall than WPB, probably just S of Ft. Pierce, but that's all. NHC intensity looks good, though I'm still not convinced it'll weaken that much over Florida. Perhaps that's just a bit of wishcasting, though, as I'm probably going to head out again for this one like I did for Bonnie. It shouldn't be anything more than a minimal hurricane at second landfall, if that, but that's three days down the road. Let's get to the east coast first. I think we're looking at 140-145 at landfall with a Cat 1 exiting in Manatee County on Sunday. Just my OPINION. Flame away gang! This is not a "guessing" game...this is very serious. Flippant comments like (not directed at you HCW, just caught my eye) that "if this gets in the gulf I'll be a Cat II). I know you're not trying to be flippant, but someone (actually millions) are going to be facing some of the most stressful times of their lives very shortly...others are obviously still deciding if they should try to leave...why they waited this long is a mystery, but it is a fact nonetheless...others still, for whatever reasons, CANNOT leave and are wondering how to protect life and limb. Let's try to keep the comments pertinent to what is about to come and leave the pedantic (how bout that HF) commentary to the forums and not the main boards. Thanks. You guys have really been great! Mike rules. Let's pray for the weakening of this monster not predicting second landfalls, 'K? The NHC is advising a slowing to 6-8 knots will lead to wobbles in the path. When this storm hits the gulfstream could it pick up forward speed as it strenghtens or are the upper and lower level winds from the high and model projections not allowing for this for the 36-48 hour forecast window? Where is the graphic that shows wind speeds out from the center? I wonder, if the current rack holds of course, the expected windspeeds in Broward. Thanks a lot. Just put it in the Favorites Folder! danielw -- indeed it is. To illustrate this, I used one of the utilities we have here called GEMPAK. Those of you in meteorology are probably familiar with it; for those of you who aren't, simply put, it allows you to display a whole bunch of meteorological data. It's akin to a programming language to display data. Since it is a rather large file, I have uploaded it to my webserver so as not to clog this webserver down. It is in Adobe PDF format and is about 900kb in size. The file contains a plot of all 12Z radio observations from across the eastern US & Bermuda along with three model output runs for comparison -- GFS in lime green, NOGAPS in red, and Eta in a barely readable yellow (my apologies). Contours are denoted every 20m, i.e. 5900m, 5920m, and so on. The number in the upper right of each station obervation gives that station's height. Of particular note are how the models handled the height in Bermuda and the heights along the east coast in Charleston and Jacksonville. Only the GFS came close; the other models kept the 5900 and 5920 lines well out to sea. I could do the same for other times and show the same thing -- and this is all without the aid of the radio observations from the G-IV surveillance plane. Just an interesting piece of info to leave you all with for the evening.